An increasing number of tech startups are ‘ location agnostic’ – meaning that it does not really matter from which location they operate. Within this context, Bas Smit conducted research for his Master International Economics and Business as to why startups relocate internationally. What are the motives and benefits of relocating for founders and how do these benefits differ by location? This information could support both new founders, as well as government incentives that try to attract foreign startups to their domestic ecosystems, such as Germany, The Netherlands and Ireland. The research by Smit was conducted with the help of Dutch Venture builder Holland Startup. A summary of the findings can be read in this article. International relocation is defined as: moving operations of a business to a different country’s entrepreneurial ecosystem. This can include the relocation of the legal entity, but is not considered a necessity to be labelled as an internationally relocated start-up. The most important motives for relocation (Table 1) were openly questioned in this research. The benefits of relocating are categorized by ecosystem domains, based on Daniel Isenberg’s model (including six pillars: Policy, Finance, Supports, Culture, Human Capital and Markets). A total of 30 interviews were conducted with relocated startup founders. One of the founders we interviewed, relocated two different startups. Making the total of observations obtained by this research 31. The old and new locations of the startups are demonstrated by Figure 1 and 2. (Click to enlarge). The main motives for international relocation, as well as the number of startups mentioning a certain motive are demonstrated in table 1. ‘ General Culture’ of the ecosystem encompasses the energy, creativity and willingness from others to help in a new startup ecosystem. 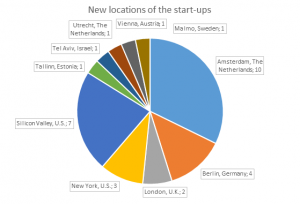 We found that relocations to European startup ecosystems are mainly triggered by start-up accelerators. These accelerators have become the overarching institutions that are able to provide access to networks that may fulfil other motives to relocate too. Relocations to the United States are mainly motivated by financial incentives, such as investment opportunities. When relocating to Silicon Valley, the culture is also a big part of the reasons to move. Do startups benefit from relocating? This research found that start-ups improve on all six of Isenberg’s ecosystem domains. The average increase is 1.2 on a 1-5 scale. This increase is positively influenced by a relocation to the United States and negatively influenced by a relocation to Berlin. The latter is mainly due to bureaucracy, as pointed out (without specifically asking for it) by 5 out of 7 founders that have relocated to Berlin. Lastly, the founders were asked to evaluate their relocation, ranking from 1 (very bad) to 10 (very good). The average score was 7.9. This score was furthermore positively influenced by improvements in policy or culture – an increase in benefits in culture or policy, such as better rules and regulations, improves the appraisal of the relocation. Since policy was not found as a motive for relocation, regulations seem to be an tool to satisfy entrepreneurs within an ecosystem, and not a way of attracting new foreign entrepreneurs. Practical implications for startups The better the startup culture and policy, the higher the scores in evaluation. Start-up founders find main motives for relocation in the market (both size and early customers), finance and support. Most founders benefit from relocating in several fields. When a founder is specifically looking for investment benefits, a relocation to the US seems profitable. The costs of living in cities such as New York and Silicon Valley are significantly higher though. This research points out that a focus point for governments could be the start-up accelerators, which provide the needed access to early customers, as well as a larger market and instruments of finance (funding) that may attract foreign entrepreneurs. It seems that, in the case of The Netherlands, a lot of specific needs that entrepreneurs have are already targeted – as shown by the focus points in a letter of startup envoy Neelie Kroes. It also seems like instruments of policy are not among the main motives to relocate, indicating that the policy domain does not have to be promoted abroad. Policy does however lead to an increase of appreciation from entrepreneurs already within the ecosystem. The observations of this research do not necessarily represent all of the relocated start-ups in the world. I am aware of the relatively high number of relocations associated with Dutch cities (n = 20), which is due to the network of both the researcher and interviewees. Lastly, the benefits are the perceived value from the founder, not the actual figures (profit, value or revenue) from the startups. Nonetheless, since this topic has not been researched before on such level, I believe the findings for the motives and benefits hold, and can serve as a starting point for future research on international relocation of startups. Want to learn more? This research was done by Bas Smit for the Master International Economics and Business, to get more insights please get in contact using email. Thanks for doing research into the motives that make early stage teams move around. As we hear from the users of Teleport (http://teleport.org) where we build tools for people to figure out where’s the best place for them to live and work, this is definitely a growing trend, especially in the era of distributed teams and innovation spawning from anywhere.